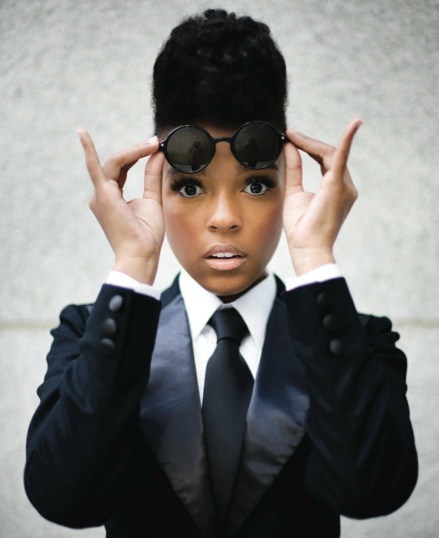 Janelle Monae Robinson was born on the 1st December 1985 in Kansas City, Kansas USA. Janelle Monae earned her fame and net worth through her musical talents, as she is a professional singer and producer. Her name is most represented in the R&B genre; however, she is also involved in the soul, funk and pop genres. She has been an active member of the music industry since 2003. Have you ever wondered how rich Janelle Monae is? According to sources, it is estimated that Janelle Monae`s net worth is $4 million, an amount acquired through her successful music career. As of today, she has released two studio albums, “ArchAndroid” in 2010 and “Electric Lady” in 2013. Furthermore, she has won a number of awards, including for the Outstanding Music Video in 2014 by the NAACP Image Awards. Janelle’s childhood was nothing to brag about, as her mother and dad were drug addicts. However, Janelle succeeded in getting away from that world with the help of her music talents, as she has been dedicated to music since her early days. She was a member of a choir in the local church, excelling in singing and also participating in some musicals at the local Theatre. She continued to develop her talents in high school, and after graduation from the F.L Schlagle High School, she enrolled in the American Musical and Dramatic Academy in New York on a full scholarship. However, she never finished the academy, because, as she has stated when interviewed, was feeling confined and wanted to write her own musicals. Soon after she left the college, Janelle moved to Atlanta, Georgia, which would later turn out to be a life-changer, as she started to collaborate with a member of the hip hop group Outcast, Antwan “Big Boi” Patton. This collaboration enabled Janelle to start her own record label, “Wondaland Arts Society”, through which she released her debut EP entitled “The Audition” in 2003. However, the EP was not greeted as well as she had hoped as it sold only 400 copies. Nevertheless, Janelle did not surrender and continued working on her career. In 2007 she released her first EP that would bring her national fame and recognition. She earned a nomination for the Best Urban\Alternative Performance for the single “Many Moons”. In addition, she toured with the group “No Doubt” which also increased her fame as well as her total net worth. In 2010, she went on to record another huge commercial success, her first studio album, entitled “Arch Android”. Because of the very nature of the album, as it was meant as a concept, and because of the whole success, Janelle earned a nomination for the Best Contemporary R&B Album award. Her most successful release set the American music scene ablaze as it peaked at number five on the Billboard top 200. It was her second album entitled “Electric Lady”, released on the 6th September 2013. Due to her previous successful release, she was able to collaborate with the singers Prince, Solange Knowles and others on this album, which contributed significantly to her fame and net worth. Overall, her career has been quite successful, and it will continue to grow, as she has signed a deal with the “Epic Records”. Adding to her net worth, Janelle has been active throughout 2015, as she has released the single “Yoga” and as well plans to release an EP through her Wondaland Arts Society record label, which will include artists signed for the label. To talk about her private life, there have been many rumors about her sexuality. However, nothing has been confirmed and Janelle has stated repeatedly that she only dates androids. Nevertheless, Janelle has been recognized as the LGBT activist. 1 My grandmother had 11 children and although we didn't have a whole lot of money, what we did have was a lot of love. My grandmother was the matriarch. If you didn't have a place to stay, if you needed food, if you were just coming out of jail or rehab, you went to her. Watching her in our family and our wider community was what inspired me and still does. 2 We have to do something about gun laws. And we also have to do something about police brutality towards African American people. We need more allies. People need to continue to speak out about the way African American people are being treated. An injustice to one black man or woman is an injustice to everybody. 3 I had a strong visceral reaction to the Moonlight (2016) script, partly because I felt I knew all of these characters. I grew up with a drug dealer like Juan in my neighborhood who was a mentor to local young people. I had a family member who was addicted to crack, like Paula. Chiron himself reminded me of my little cousin - they were all characters I could relate to from my upbringing. And I've played the role of Teresa in real life: my family and friends always have a shoulder to lean on with me. 4 I've never viewed myself as "just" a musician or singer. I'm a storyteller who wants to tell untold, meaningful, universal stories in unforgettable ways. I want to do it all, study it all and find my place in it. 5 [observation, 2014] I'd be honored to experiment more with holograms and maybe make a whole band - but I love my band. I wouldn't want them to be holograms. 6 I feel myself becoming the fearless person I have dreamt of being. Have I arrived? No. But I'm constantly evolving and challenging myself to be unafraid to make mistakes. 7 I've always wanted people to ask questions about the music. Some songs you get. Some songs you may not. And I think that's the beauty of art: to question and to ask, to understand the deeper meaning after two or three or four listenings. I appreciate that as a writer because sometimes the mystery, when it's gone, is not as interesting. I love the mystery behind things. Hidden Figures 2016 performer: "Isn't This The World"
BET Awards 2016 2016 TV Movie performer: "Delirious", "Kiss", "Pop Life", "I Would Die 4 U"
BET Awards 2015 2015 TV Movie performer: "Yoga" / writer: "Yoga"
Rio 2 2014 lyrics: "What Is Love Cast", "What Is Love" / music: "What Is Love Cast", "What Is Love" / performer: "What Is Love Cast", "What Is Love"
Stevie Wonder with Friends: Celebrating a Message of Peace 2013 TV Special performer: "Higher Ground"
2012 MTV Movie Awards 2012 TV Special performer: "We Are Young"
The 53rd Annual Grammy Awards 2011 TV Special performer: "Nothin' On You", "Tight Rope" / writer: "Tight Rope"
For Colored Girls 2010 performer: "Without a Fight"
2011 Grammy Grammy Awards Best Contemporary R&B Album For the album "The ArchAndroid." 2009 Grammy Grammy Awards Best Urban/Alternative Performance For the song "Many Moons."